Few would argue the case that Rotherham Titans have proved something of a bogey team for Doncaster Knights. 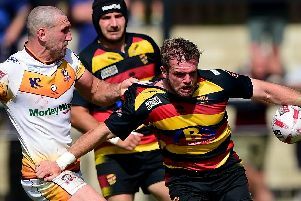 The Titans have won the last seven games between the two clubs which means they cannot be written off ahead of tomorrow’s televised Championship derby at Castle Park even though they have lost their last seven matches. In contrast, Knights have won 12 of their last 13 games and are on course for their best ever season at this level. But the contrast in fortunes is not something director of rugby Clive Griffiths has dwelled upon in the build-up. “As I have said before, the form book goes out of the window in local derbies,” he said. The Titans have been badly hit by injuries this season, which has contributed to their lowly league position but things have started to look up in the last fortnight.